How do you describe the motion of an object as it travels upward and downward under the force of gravity (free fall)? How do you draw the motion diagrams for objects in free fall, on Earth and on another planet? How do you draw position-time, velocity-time and acceleration-time graphs for an object in free fall, on Earth and on another planet? How do you mathematically calculate the factors involved in free fall? How do you describe the motion of an object that is thrown horizontally? How do you draw motion diagrams for the horizontal and vertical motion of an object that is thrown with an initial horizontal velocity? How do you graphically represent the horizontal and vertical motion of an object that is thrown with an initial horizontal velocity? How do you mathematically calculate the factors involved in the motion of an object that is thrown with an initial horizontal velocity? How do you qualitatively describe the trajectories of an object thrown at an angle, such as a football or basketball? An object in free fall has only the force of gravity acting on it. The acceleration of an object in free fall is constant on any given planet (or satellite of a planet). Projectile motion can be described as a combination of uniform motion along the horizontal direction and uniform accelerated motion along the vertical direction. From a conducted experiment of an object in free fall, analyze its vertical motion according to its change in position, velocity and acceleration with time. a) Describe the effect of mass on the time taken for an object to fall. Demonstrate that acceleration due to gravity does not depend on mass. b) Use technology (i.e., motion detector, picket fence, spark timer) to collect data and analyze free fall motion. c) Determine that the acceleration has a downward direction, regardless of whether the object is moving upward or downward. d) Analyze the position, velocity and acceleration in upward and downward directions for an object thrown upward. 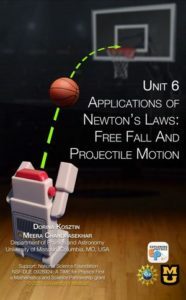 Describe the vertical motion of an object in free fall, using multiple representations (i.e., verbal descriptions, motion diagrams, force diagrams, graphs and mathematical models). a) Verbally describe the motion of an object in free fall. b) Draw a motion diagram for an object in free fall, with velocity and acceleration vectors. c) Draw force diagrams of falling objects. d) Construct position-time (x vs. t), velocity-time (v vs. t) and acceleration-time (a vs. t) graphs for an object in free fall. e) Develop a mathematical model that describes the vertical downward and upward motion of an object. f) Convert among different representations. Graphically and mathematically determine the acceleration of an object in free fall. a) Describe the significance of the slope of the v vs. t graph. b) Generate an a vs. t graph from a v vs. t graph. c) Mathematically calculate acceleration from a v vs. t graph. d) Determine that acceleration due to gravity (g = 9.8 m/s2) is the same as the strength of the gravitational force determined in the unit on Forces and Newton’s Laws. Mathematically and graphically determine the displacement and velocity of an object in free fall. a) Calculate the slope of an x vs. t graph to determine instantaneous velocities of an object infree fall. b) Use the mathematical expression to calculate the displacement and instantaneous velocity of an object in free fall. c) Determine the displacement of an object in free fall by finding the area under a v vs. t graph. d) Given the initial conditions, use mathematical expressions to determine unknowns, such as time of flight, initial and final velocities, height the object reaches (for an object thrown upward). Design and conduct experiments to study the motion of an object following a two-dimensional trajectory. a) Compare the effect of gravity on objects that are dropped vs. objects that are thrown horizontally. b) Describe the trajectory of a projectile. c) Collect data and graph vertical position vs. horizontal position for a projectile shot with horizontal velocity. d) Investigate how the launch angle affects an object’s horizontal range, and determine the angle that produces the maximum range. Analyze the two-dimensional motion of an object shot with an initial horizontal velocity. a) Describe projectile motion as a combination of independent vertical and horizontal motions. b) Determine that a projectile’s horizontal motion is uniform by analyzing x vs. t graph. c) Determine that a projectile’s vertical motion is accelerated motion by analyzing a y vs. t graph. Describe an object in two-dimensional motion, using multiple representations (i.e., verbal descriptions, motion diagrams, force diagrams, graphs, mathematical models, etc.). a) Verbally describe the two-dimensional motion of a projectile. b) Construct a motion diagram for the horizontal and for the vertical motions of a projectile, including velocity and acceleration. c) Draw and label a force diagram for a projectile at various points along its trajectory, showing that the only force acting on it is gravity. d) Compare and contrast the horizontal and vertical motions of a projectile by sketching position- time, velocity-time and acceleration-time graphs. e) Use mathematical models (uniform motion or accelerated motion model) to describe the horizontal and vertical motions of a projectile. f) Convert among different representations. For the two-dimensional motion of an object launched with an initial horizontal velocity, construct and interpret (vertical and horizontal) position vs. time, velocity vs. time, and acceleration vs. time graphs. a) Generate position-time graphs from data of the motion of a projectile. b) Analyze position-time graphs to obtain velocity-time graphs. c) Analyze velocity-time graphs to obtain acceleration-time graphs. Mathematically and graphically determine the vertical and horizontal displacement, velocity and acceleration of an object launched with an initial horizontal velocity. a) Determine the time of flight, the point where the projectile lands, and velocity at impact given information about the initial velocity and initial position of a projectile. b) Determine the parameters needed to hit an object set at a certain horizontal and vertical distance from the launch point.